The Bear Lake whitefish, Prosopium abyssicola, is found only in Bear Lake on the Utah-Idaho border. The species inhabits the cold areas of Bear Lake, staying in deeper water during the summer months. Bear Lake whitefish are the focus of limited angling, particularly during their spawning period. These fish form large schools during their spawning season, which lasts from February to May. Spawning occurs over limited structure in the lake, and young fish hatch out in early summer. Bear Lake whitefish eat a variety of small aquatic invertebrates, fish eggs, and occasionally other fishes. They are silvery in color, with younger fish having numerous dark spots on their backs. Bear Lake whitefish are almost indistinguishable from young Bonneville whitefish (which get much larger than Bear Lake whitefish), and scale counts are the best way to distinguish the two. 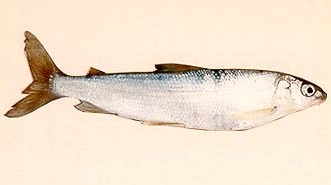 Bear Lake whitefish generally do not exceed 270 mm in total length. This species of native fish is indistinguishable from Bonneville Whitefish below 10 inches in length. Bear Lake Whitefish occur only in Bear Lake and nowhere else in the world. Another species of whitefish is the Mountain Whitefish. Whitefish are part of the trout family (Salmonidae). They have one distinguishing characteristic that puts them there and that is an adipose fin. The Bear Lake whitefish are "cousins" with the mountain whitefish, which are found in many streams and some lakes here in Utah and the western US. Whitefish are not chubs. However, whitefish have many common (colloquial) names. Some of the more common ones are: herring, cisco, tulibee, rounds, Menominee, and whiteys.